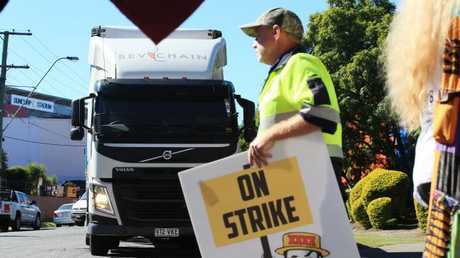 STRIKING XXXX brewery workers have blocked trucks from entering the Milton factory today and vowed to escalate their increasingly bitter industrial dispute over job security. 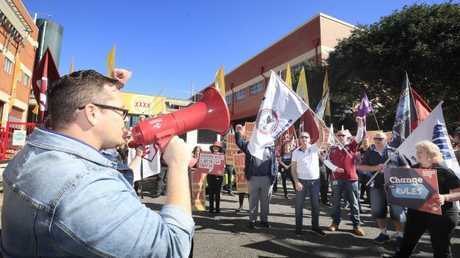 A crowd of about 150 protesters made up of members from United Voice Queensland, the Electrical Trades Union and the Maritime Union protested outside the main brewery gates from 10.30am. 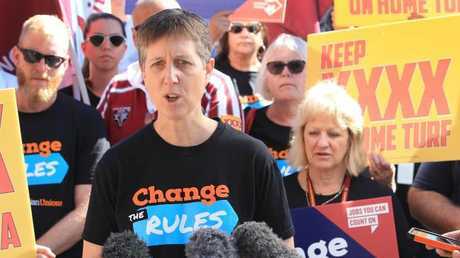 Australian Council of Trade Unions secretary Sally McManus joined the brewery workers for the first time since they started a campaign of limited strikes about two months ago. "I'm sorry I couldn't get here earlier but I'm here now and I'm proud to say that this dispute is escalating and anything you ask for you'll get," she said while standing on the back of ute. Ms McManus said the fight was for job security and for ensuring casuals received a 25 per cent loading from XXXX's parent company, Lion. "We think it's critically important that if Lion wants to use labour hire it should only be for peaks and troughs and we believe that actually what they're trying to do is replace the workforce over time and we think that this is the wrong business model," she said. United Voice spokesman Damien Davie at the rally. 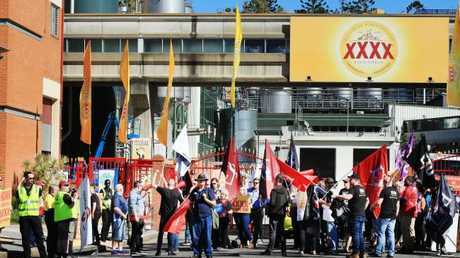 XXXX workers blocked trucks from entering the Milton brewery. XXXX brewery manager Irene Bell said the company's priority had always been providing full-time, secure and stable jobs. 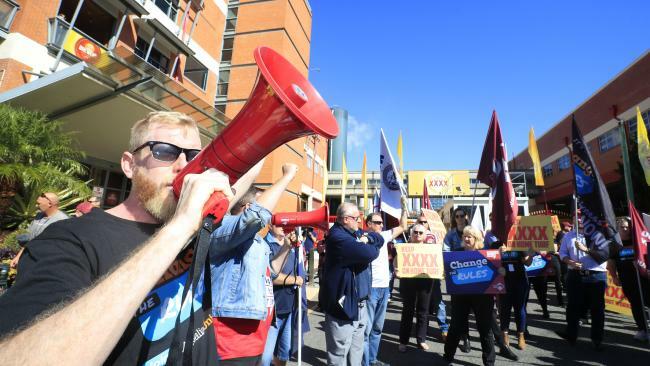 "We need the option to engage part-time or fixed-term workers as well as third party labour to flex up our operations and cover sick or long service leave," she said. "This is about supplementing our permanent work force not replacing it." "This is about establishing clear clauses in the new agreement which will explain to our permanent workers how this type of labour is used at Milton. We are proposing rates of pay that are in line with the rates of our permanent workforce." 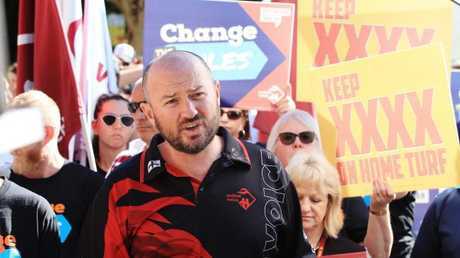 Supporters at the XXXX rally. XXXX workers are taking strike action for a ninth time. During the 45-minute protest, the crowd spilled into the street, blocking the main entrance as trucks were attempting to enter the brewery. Security guards attempted to clear a path for the trucks but were told to go away and wait until one of the unionists had finished telling his story, forcing the trucks to drive away down a side street.